As you have seen from a previous post by Fernando Rivadavia, at the end of last year I went through some countries in South America and had time to go looking for some CPs. One of the plants I hunted for was P.chuquisacensis in Bolivia. I had some very precise info about its locality including some GPS coordinates and the name of a nearby town. With this information I planned my route while travelling around Bolivia to include the city of Sucre, second most important city in Bolivia and the best place for renting a car and go hunting for this plant. From Sucre I had to drive around 200km mostly by unpaved road to Villa Serrano, the town closest to the plants. This turned out to be a long but nice drive with different and interesting landscapes including arid deserts, rocky cliffs, dry shrubs and forests and finally the humid cloud forests at the end of the trip. At Villa Serrano we spent one night, planning to go the next day early in the morning to Nuevo Mundo, aprox. 30 Km away by a muddy road. The pings were supposed to be located very near that road just before arriving at Nuevo Mundo. Being the only place were this species has been found, I think they are highly vulnerable. Fortunately the species is now under culture and the plants are growing fine, because the future of the plants in this habitat is uncertain. Any work made on the road can make all this plants disappear forever. I hope you liked this story and pictures. What an excellent field report!! great pictures and very nice report. I really like the landscape, especially these cloudy mountains. It looks a little bit like that the wall is made by humans because of the street, are the plants also growing above this wall or near to this location? On what altitude are they growing and what are the temperatures? Thanks for asking, i forgot to mention those details. The plants grow only on the vertical wall and near the base, elevation is 2212m measured with my GPS. I can only tell about the temperatures for the short time I was there on a cloudy day and early in the morning (8 am). I think temps were around 13 centigrade degrees, but this is just by feeling. I did not have a thermometer with me. Wow, great pictures Sebas, thanks so much for sharing! I especially enjoyed the picture showing the thick rhizome, it's amazing! Too bad you didn't get to see any open flowers though. As for the population, it does truly seem extremely vulnerable. But there MUST be more in the vicinity! After all, that vertical wall is artificial to begin with, made when the road was bulit. So the plants must have come from another nearby cliff, probably further up the mountains. I was waiting for your post with impatience. Thank you very much for that report. Even if there wasn't any flower, it's full of information. This type of rhizome is quite unusual in the genus Pinguicula. Are the whitish structures produced by the rhizomes roots or stolons? It's look like the stolons of Pinguicula vallisneriifolia. As Fernando said, there must be some more locations in the neighbourghood. It seems to be a very wild place so with a little more exploration, it can be easy to find more. These rhizomes are really very interesting, never seen them in any other species. The longest "stem" (or rhizome, if you like) I meassured in a herbarium specimen of P. chuquisacensis was about 10 cm long! 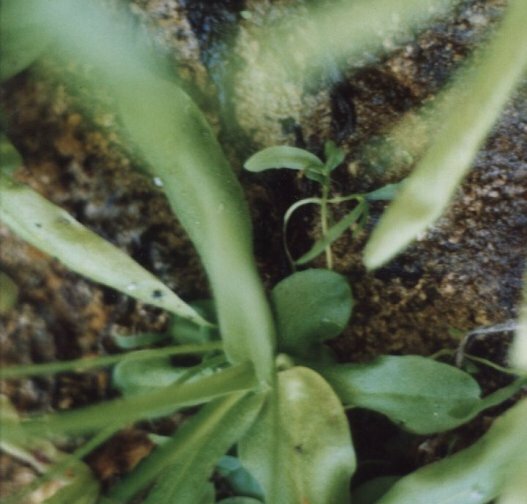 Daniel, however these rhizoms are common in every long-living homophyllous Pinguicula. It's just that you normally do not notice them, as the plants are gowing with their substrate. But if you excavate/repot an old P. moranensis, for example, you will note that it has a long underground stem, which slowly decayes from its back end. Thanks for the great photo-diary Sebastian! A fantastic read. I think it's necessary to stay there for some days and explore the area very well. Jeff: No plans to go back to Bolivia in the future, maybe some of the plants in cultivation will show us their flowers soon. Interests:Habitats, Highlander CPs, Schuhplattler and Scuba diving. is a great expedition, Bolivia look's a nice place. I will wait for these shots. Last weekend I noticed that some of the seed of P.chiquicasensis I sowed about 1 month ago germinated. Looking good! Was this plant in cultivation before you germinated those seeds? Very nice field trip Sebastian! Great Sebastian! That's a nice perspective for introducing it in culture, it seems to have a great germination rate. How are your sawing conditions? As Fernando said, it is already in cultivation in Germany. My sowing conditions are just the same I use for growing my P.emarginata. Soil mix of quartz sand with some peat and tray watering. Bright indirect sun in the afternoon and around two hours of direct sun in the morning. hi, Sebastian i ve read and seen your report by the pinguiculas chuquisacensis in bolivia im glad and proud to have this kind of carnivorous im from cochambamba bolivia living right now in spain, im sure when i come back t my country ill be there to see those plants, what about the animales around they use to eat them? or any problems? im sure that u get some plants o seeds, tell me is the plants ok? adaptading in the climate where u live? I have two large plants in cultivation that already flowered this spring. They do indeed make stolons similar tho these of P. vallisneriifolia but more robust. It's a quite interesting fact about this species.